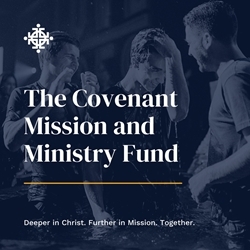 This year, the Covenant has received a generous matching gift of $100,000 toward the President’s Mission & Ministry fund. All new dollars will be matched. Please consider making a gift today to double your impact as we further Christ’s mission together. We encourage you to consider the positive impact you could make by becoming a President’s Circle member through your annual gift of $1,000 or more to the President’s Mission & Ministry Fund. Become a member of the President’s Circle today.